Unfortunately the "Free $10 to Spend on eBay" offer is no longer available. Okay, this has got to be the best TopCashBack freebie to date, in my opinion. 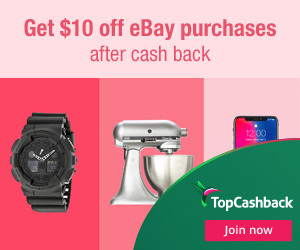 Get $10 off any eBay purchase after cashback. Get a free $10 item or save on your bigger purchase. Since eBay carries it all, your sure to find something to treat yourself to! 2. Once logged in, click the "Get Offer" button and you'll be directed to the eBay website to make your purchase. Note: If you're on mobile, scroll down and click on "View Desktop Site" to see the cashback button.